to study them and make Turks and the world aware of them. The silks made by the new Turkish brand Armaggan Nişantaşı are quite possibly the best luxury fabrics being made in the world today. HALI’s editor unravels the historic thread. IN A RETAIL PARK on the outskirts of Istanbul, a remarkable project has recently reached fruition thanks to the work of the Turkish Cultural Foundation, the Turkish luxury brand Armaggan Nişantaşı, and Professor Recep Karadağ of Marmara University. On entering the premises, one might believe that you have entered a design studio of a fashion house rather the home of one of the world’s most ambitious textile weaving projects: the reproduction of the complex silks embellished with precious metal thread made in Ottoman period. These silks, the embodiment of the majesty and power of the Imperial court, are well-known to HALI through the royal kaftans in the Topkapı Palace Museum (see Nurhan Atasoy et al., Ipek, 2001; HALI 34, 1987, pp.24-31; HALI 88, 1996, pp.78-87). However their brilliance is not a vestige of an imperial past but today can be bought in the form of faithful reproductions at the seven-storey retail premises of the newly established luxury brand Armaggan Nişantaşı, nestled amongst celebrated labels as Chanel, Louis Vuitton and Cartier in Istanbul’s premier shopping street, Abdi Ipekçi Caddesi in Nişantaşı. The complexity of the processes undertaken to make each short bolt of silk is an apt metaphor for the history of the project’s origin, beginning with The Natural Dyes Research Development and Application Center (DATU). This centre of excellence is housed on the top floor of the buiding alongside a collection of Anatolian handlooms rescued and restored by Karadağ and his team. The laboratory has, over the last two years, assembled a collection of 400 natural dye plants from around the world. All of these have been analysed in the laboratory which has also derived pigments from most, that are subsequently used to dye sample material, which are then tested again in order to create the most complete record of the dyes possible. Nişantaşı, which is also linked to The TCF. Armaggan’s textiles are made from silk and wool dyed on site using these historic dye recipes. Indeed the sight of hanks of wool and silk being dyed to exact shades of light pink and green in front of me was quite mesmerising. handful of huge Jacquard looms slowly clicking through their programmed cards, producing barely two inches per day of these perfectly rendered patterns. Through the expertise of the draughtsman and masterweaver Koray Dağci and the research of Prof Karadağ the exact construction, colouring, metal content, weave and pattern of the original complex silks has been analysed and reproduced for this production. The resulting silks are surely among the most remarkable textiles being made anywhere in the world today. Although the processes involved are complex, the sublime beauty of the finished products simply reflect the freedom and exuberance seen in the patterns themselves. These silks are a small part of the products, including jewellery, naturally dyed textiles and homewares, exclusively commissioned by Armaggan Nişantaşı. However these objects are distinct from the material elsewhere in this district in that they are all designed by Turkish designers and handcrafted in the company’s own Turkey-based ateliers employing leading, yet anonymous, Turkish craftsmen. All of the objects reflect the brand’s stated intent to promote and protect traditional Turkish craft skills, but the beauty of the objects is clearly not a secondary value. 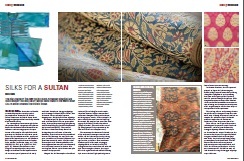 With this in mind we look forward to seeing the Armaggan Nişantaşı carpet collection. In 1997 DATU performed dye tests on four Ushak carpets found in 16th century Şeyh Muhyiddin and Bünyamin Ayaşı Mosques in the city of Ayaş, some sixty kilometres from Ankara.The four fragmented carpets are all originally in the 30-40m2 size range are split evenly between medallion and peony design types. These carpets, all of which are now in the collection of the Vakıflar were analysed for structure, materials and dyes by the laboratory in the same way as the other samples taken from historical objects.The results indicated the use of madder (Rubia tinctorum L.), gall oak (Quercus infectoria Olivier) or valonia oak (Quercus ithaburensis Decaisn), hemp (Datisca cannabina L.), indigo (Indigofera tinctoria L.) or woad (Isatis tinctoria L.), all consistent with the results of tests from Ushak carpets in the Turkish and Islamic Art Museum.